The historic town of Korcula is part of the Tentative list of Croatia in order to qualify for inclusion in the World Heritage List. The old town of Korcula is the major town of the homonymous island, it occupies a small elliptic peninsula of about 300 meters length and is surrounded on three sides by water. The old town is surrounded by walls, has narrow, steep streets, a cathedral with a bell tower etc. Quite nice, but nothing that is not already represented by other Croatian WHS. 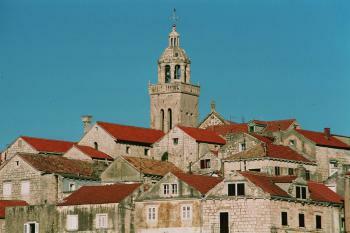 Korcula claims to be the birth place of Marco Polo, you can visit his alleged birthhouse, but there is no valid historical proof for that. We reached Korcula after an hour drive from Mali Ston to Orebic through the sparsely populated peninsula Pelješac, and then from Orebić by ferry to the port of Korĉula (photo: view from the ferry).